If you are looking for amazing history, beautiful beaches, airline accessibility and top notch hotel / casinos, Santo Domingo in the Dominican Republic has it all. In 2009 alone, more than three million visitors vacationed here! Santo Domingo is literally the first city of the New World. In 1492, Christopher Columbus landed here. It was the first of his many discoveries in the Americas. The Dominican Republic (called Hispaniola by Columbus) is the oldest country of the Americas. Santo Domingo is the site of the first catholic cathedral, the first university and the first hospital in the Americas. 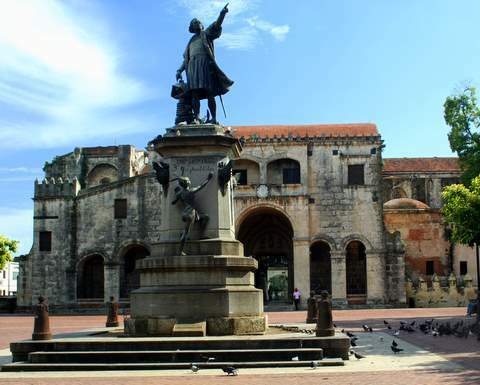 The historic section of Santo Domingo is called The Colonial City. It is a UNESCO World Heritage Site. In addition to the cathedral, university and hospital, visitors can also explore Columbus’ home Alcazar de Colon and the Ozama Fort. Cobblestone streets that Spanish conquistadors once walked lead you past many historic sites and even to an original city gate which offers a fantastic photo opportunity. The Columbus Lighthouse is an impressive structure both inside and out. It contains multiple rooms highlighting the history of Santo Domingo. The tomb of Christopher Columbus resides impressively in the center of the lighthouse. Because the Pope once spoke here, the “Popemobile” papal vehicle is displayed near the entrance. Santo Domingo shares in the 800 miles of beautiful Dominican Republic coastline. Because of the large waves and lack of sharks, surfing competitions are held here annually. With an 80 degree average water temperature and 80 degree average air temperature, watersports are very comfortable for everyone. If you choose to venture outside the city, you can enjoy whale watching, a hike though the mountains or a visit to a waterfall. We suggest you take a professional tour service to your desired destination because traffic is intense in the city and traffic rules are not always apparent. For those who enjoy shopping as part of their vacation adventures, Santo Domingo offers stunning amber and larimar jewelry. Larimar is a blue pectolite that is only found in the Dominican Republic. Amber is a hardened tree sap that often contains the remains of insects, leaves or lizards entombed within it thousands of years ago. The Amber Museum not only sells amber jewelry but offers a second floor tour offering an in-depth look at amber. Travelers have several options for accommodations in Santo Domingo. The Hotel Santo Domingo is just 30 minutes from Las Americas International Airport on the picturesque Malecon ocean front boulevard. Surrounded by 14 acres of lush tropical gardens, the Hotel Santo Domingo offers comfortable and oversized guest rooms, executive security features, the Excel Club Floor and private helipad. The Renaissance Santo Domingo Jaragua Hotel & Casino is “the only resort-like Santo Domingo luxury hotel.” It is located on the Malecon near Santo Domingo's most popular attractions, beaches, and shopping. The Jaragua offers 288 rooms in 10 floors. The Casino Diamante at the Melia Santo Domingo hotel offers 50 slot machines, 20 game tables and 245 "lavishly renovated guests rooms." Santo Domingo in the Dominican Republic has spectacular historical significance, uniquely beautiful larimar and amber jewelry, beaches that draw surfers from around the world, and easy air and cruise accessibility. Watch our Santo Domingo video below.